What fun! A rest stop on a trekking adventure. The little guy is bold and daring to attack the bag — at least he thinks so — you can see his trepidation! Charge and retreat. Might it bite back? Maybe he’s seen a bag behaving erratically by blowing in the wind and wondered if it might do something unexpected? I had been shooting stills, but when I realized what was happening I quickly switched to video. But that is about when the play stopped, so the video is very short. 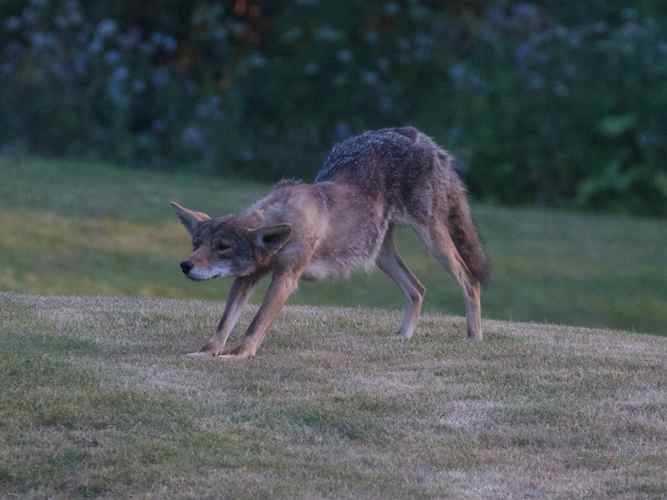 However, it’s enough to give an idea of this coyote playing. 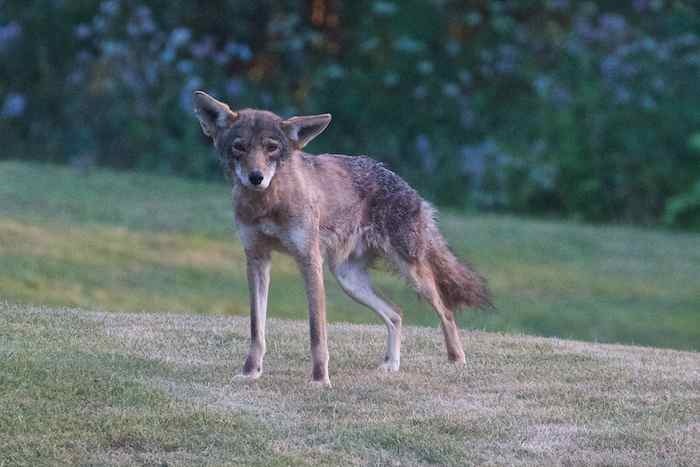 When coyotes are injured, they tend to lay low — I wondered why I hadn’t seen this one, and now I know. Injuries are not uncommon in our wild animals. Although wild critters are pretty resilient, if an injury impairs an animal’s ability to get away from danger, or if it interferes with effective hunting, it could spell the end. This injury, affecting the left front leg, could be an injury to the elbow, shoulder, wrist or paw. 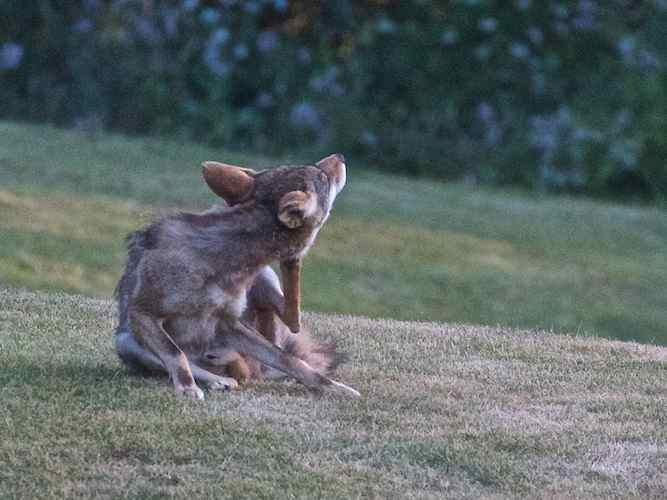 Coyotes can twist their “ankles” like the rest of us, when they hit a hole in the ground going full speed. Of course, normally they are not going full speed — unless they need to get away from a dog which is chasing it, or possibly from a car on the road. Hopefully it will heal quickly. Three years ago, this same coyote sustained a back-leg injury which caused severe limping for over a month. She was hit by a car. It was June and she was a single mom with two young pups. We knew that nature would take care of her, and we knew that any interference on our part would make matters worse. We watched, and sure enough, she healed, and her pups grew up! Suddenly there was a commotion from the Ravens. I heard their loud cries of alarm — they often call out when they sense impending danger. I didn’t see anything, but I waited. 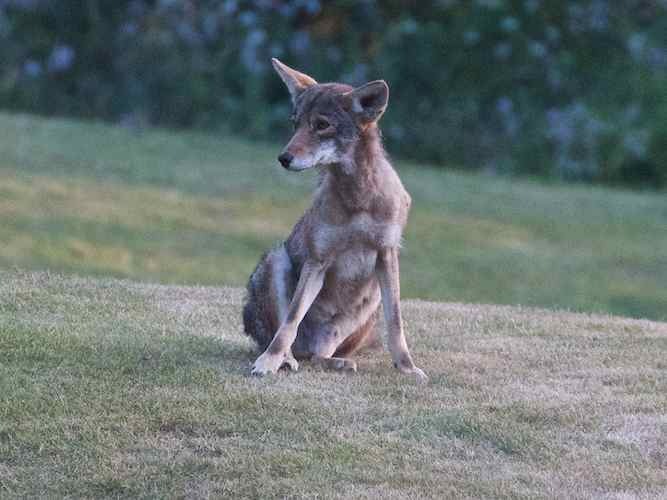 Sure enough two coyotes appeared on a hill — I knew it! I knew coyotes were the cause of all the unhappy Raven noise! They appeared to be trekking through — and that often is enough to cause alarm among the Ravens. The coyotes sat down and observed their surroundings. Then, one of them stood up, tensed up and became focused — I decided to aim my camera in that direction. The cawing continued, even though there was no activity that I could see — except the tension in the coyote, and the cawing of the Ravens. So the three of us were tense: me, coyote, Ravens. And then, in my viewfinder, there appeared the part of the equation that was missing! Foiled by the Ravens? This coyote headed up a hill and began digging and pawing the ground. It looked like any other hunting session, only there was a little more “pulling” than usual. 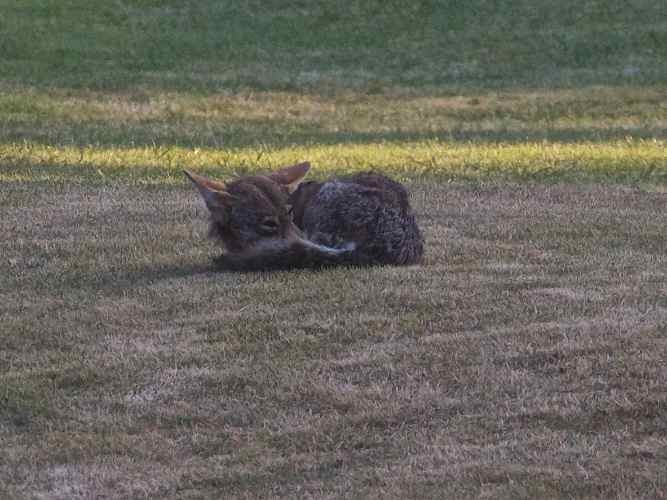 When it finally looked perfect, the coyote circled around and then curled up comfortably. It had not been hunting at all — it had been digging a little hollow and moving the grass around into a comfortable place to rest! The grasses were tall. The wind was blowing gently. There was a siren. The coyote looked up and listened — he looked up and listened twice. And then began the amazing fugue. 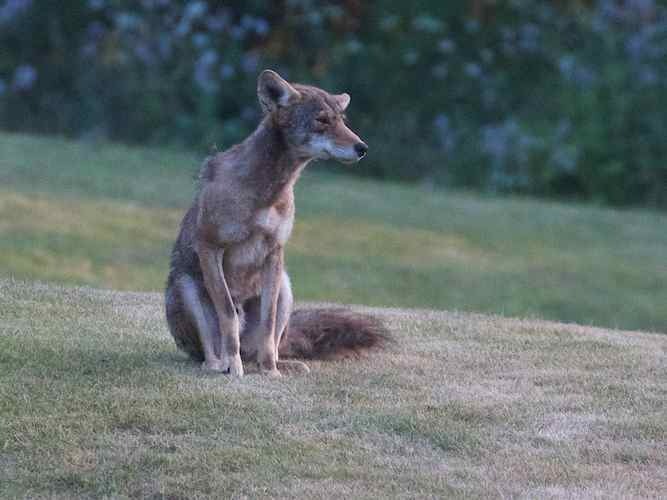 I never saw the other coyote — it was in the bushes. 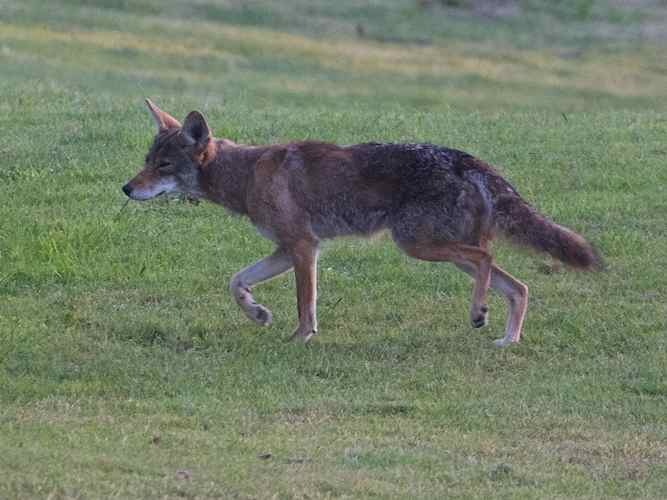 Compare this to the last recording: both involve two coyotes, but are very different. 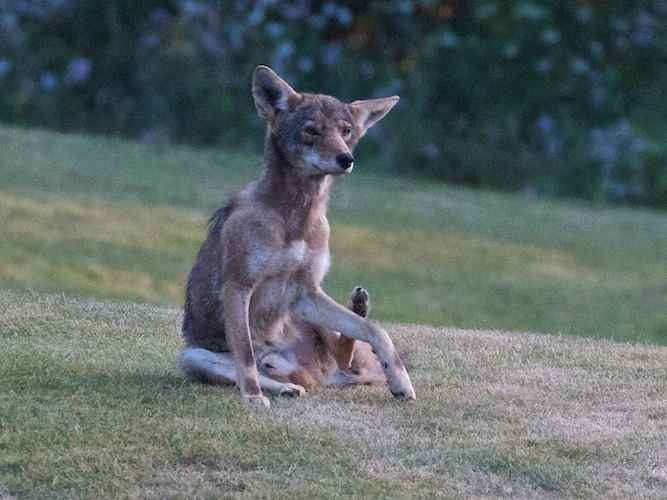 This one here has extended mournful howls and squeals from one coyote, while the one you see in the video is actually barking most of the time. I never cease to get exciting when I hear these amazing sounds. What happens to our urban wildlife neighbors as they age? I took some photos of an older coyote today. I could see that, as the years go by, the body becomes worn and feels the effects of the accumulated wear and tear, and the effects of time. There is a slightly slower gait and it takes longer to get going. You are a little stiffer and some of your joints hurt — bending to scratch takes a little more effort and does not look as easy as it used to. You seem to crumple into a blob when you sit sometimes, hanging from your bones instead of sitting up straight and strong. More time is spent napping during the day and you forget that you’ve already stretched before you take off — or maybe it just takes more stretches to get all the kinks out? Your coat is a little more ragged, tattered and torn and the many scars underneath show through. Not only might your eyes be more swollen, you have to squint often to see past your weaker eyesight — and the animal world doesn’t have the privilege of glasses. Unless a gopher is an easy catch you won’t go for it. But, to me, it is because of these changes that this coyotes is more adorable than ever. He’s worked hard and earned every one of these badges of his accumulated years. Also, young pups have come and gone, and so have a couple of mates. Life never has been particularly easy, and I can see that it is less so with time. 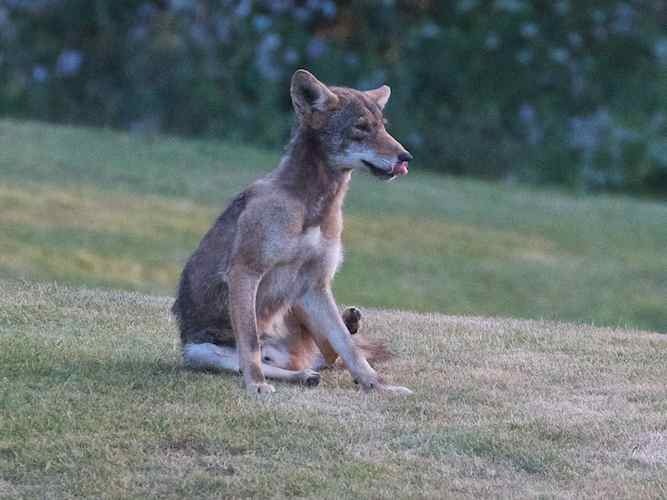 What really matters is that this coyote is still the alpha of his pack, that this is his own territory, that he protects and hunts every day for his family and his yearly offspring. San Francisco in one of the best habitats around: there is water nearby, there still are trees and thickets which provide protection and cover, and there are fields for hunting! Life is still pretty good!